I have cut down on coffee a lot within the past year, so tea is my drink of choice when I need something warm. It one of those things that helps me relax. I prefer buying loose leaf tea because it's cheaper and it usually tastes more fresh. However, finding an Infuser that seeps the tea out correctly can be a total pain...and I have gone through many. 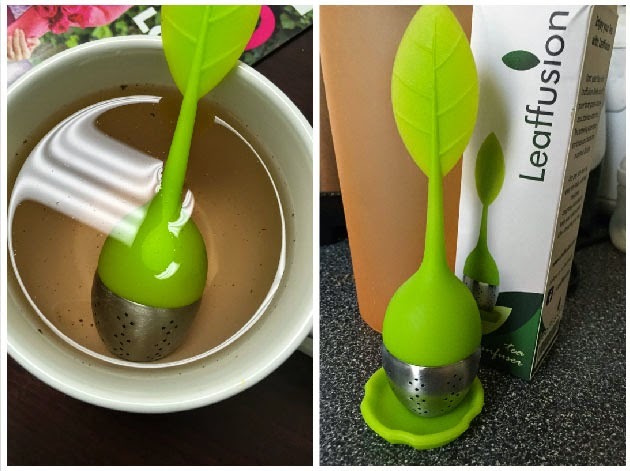 I recently tried Leaffusion and I am incredibly impressed with this adorable Infuser. It is easy to open and close. The design is sleek and fits in any cup or mug. It is relatively easy to clean. Depending on the type of tea you use (or the strength you prefer), you can brew the same batch of tea twice. There are a few bits of tea that will escape the holes. I know this bothers some tea drinkers but it doesn't bother me. If you drink tea, definitely think about Leaffusion. ***Disclosure: I received this product complimentary from Leaffusion for my honest review. I was not compensated for this post and all opinions are my own.